One area I have found almost every home kitchen to be lacking in is a proper approach to sanitation and cleanliness. Under normal circumstances, this would be more of a trivial matter. But when our loved one is fighting cancer, these treatments often suppress their immune systems, making something as simple as mild food poisoning an emergency room worthy offense. In this article, I am going to teach you restaurant grade sanitation and cleanliness standards. These same standards are used in restaurants throughout the United States and violations of these standards can have implications serious enough to close down your business. Lets talk about a real world situation that I have personally intervened in. This person had recently been to the grocery store and decided to purchase a large plastic package of flash frozen chicken breasts which she then placed onto the top shelf directly above her crisper drawer. This drawer was filled with some newly purchased fresh produce. The owner of this refrigerator had suggested simply rinsing the produce and refrigerator off with water. This is the WORST IDEA POSSIBLE! The water will simply move the bacteria from one surface to the next and make your contamination problem worse. After much scolding from me, I was able to properly dispose of all the contaminated foods and properly sanitize the inside of the refrigerator. The moral of the story is that cross contamination, once it has occurred, is final. If this had occurred at my restaurant and someone had become ill because of this, I could be personally liable both morally and legally for any damages that occurred due to my negligence. You should therefore treat your home with no less diligence than we are legally required to in a professional restaurant. Now let’s talk about these common kitchen mistakes that you can easily avoid. 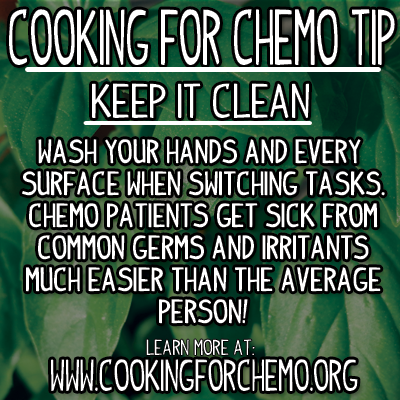 Cross Contamination is something that can have a dangerous impact on someone going through chemotherapy. Cross contamination is where bacteria or other contaminants migrate from one food or surface to another. Examples of this are salmonella, E. coli, dirt, or chemical contaminates. Any of these can make your loved one very sick. We want to use great care when preparing our food to make certain that none of these contaminates are present in our foods. The best way to avoid cross contamination is to thoroughly wash and sanitize every surface after use. This includes sanitizing every time we switch tasks. One of the most dangerous food items that we work with on a daily basis is actually chicken. Chicken naturally contains a bacteria strain called salmonella, which I am certain you have heard of. This bacteria can cause violent food poisoning and hospitalization. The most surefire way to kill this bacteria is by cooking all of your chicken to 165 degrees Fahrenheit. This guarantees that there are no living bacteria present in your food. But, what happens if this bacteria ends up in your salad? You do not cook the lettuce inside of your salad. Therefore, if any salmonella accidentally contaminated your lettuce, more than likely, you will be spending the next 24 hours in the bathroom. This is why it is so important to clean and sanitize every working surface in your kitchen so that you may prevent cross contamination. Washing your hands is the single most important step to avoiding cross contamination. Your fingers pick up oil, residue, chemicals, and bacteria from every last item they touch. The best way to remove these is by using a mild hand soap and water making sure to scrub every crevice and underneath your fingernails. Hand sanitizer alone is actually not very effective at cleaning your hands or killing bacteria by itself. Even if you intend on using gloves to prepare your food, you still need to thoroughly wash your hands because the gloves themselves are not perfect barriers. I know that to many people being told to wash your hands seems like common sense. But for every person to who knows to wash their hands regularly, there is another person that does not. I, for one, love my steak cooked medium rare! 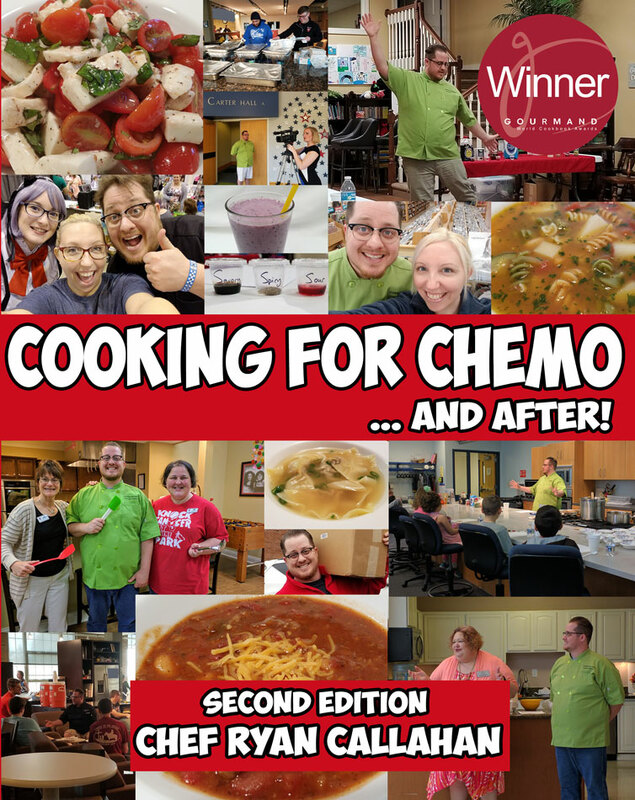 But, for someone undergoing chemotherapy treatments, it is better to cook all of our foods to a well done temperature. This is because cooking everything to a well done temperature is one of the best ways to counter-act potential bacterial food poisoning. I highly recommend you purchase a quick read kitchen thermometer like the ones chefs use all around the country every single day. Well done cooking temperatures vary based on food item. These temperatures are set by the USDA. I would recommend visiting their website: usda.gov for more information. One of the ways cooking temperatures come into play involves cross contamination and is called Drip Theory. Simply put, drip theory is where you imagine the consequences of what would happen if liquid from one food item dripped onto another food item. If some condensation drips off of a carrot and onto some uncooked chicken breast, any bacteria that was present on that carrot will be killed by the final cooking temperature of the chicken breast at 165 degrees. Inversely, if that piece of uncooked chicken had a drop of its liquid fall onto that carrot and then you proceeded to eat that carrot raw, that chicken breast’s bacteria would be alive and well to go galavanting around your small intestine utterly unchecked, kind of like unsupervised children in an antique shop. Neither one is an ideal situation. In order to prevent this very preventable catastrophe from occurring, we need to organize our refrigerators in a different fashion. We want to place the least contaminating foods towards the top and the most contaminating foods at the bottom. You can identify the most and least contaminating based on its cooking temperature. The carrot in our earlier example may be eaten raw and therefore falls into the least contaminating category. Where as our chicken breast requires the highest cooking temperature and is therefore the most contaminating. Following this method seems counter-indicated by the way home refrigerators are actually built. In a home refrigerator, your manufacturer places your crisper and fresh drawers at the bottom, which as we have just learned from drip theory, is actually the most dangerous place to put fresh food items. If you stick to keeping your kitchen and hands clean and your cooking temperatures accurate, you can help to prevent one of the easiest but most uncomfortable conditions that someone fighting cancer can go through, food poisoning. Using these tips and techniques you have just become a more successful caregiver and cancer fighter.